The writer of the new BLACK PANTHER: THE MAN WITHOUT FEAR series, talks about bringing T'Challa to Hell's Kitchen to take over for Daredevil. 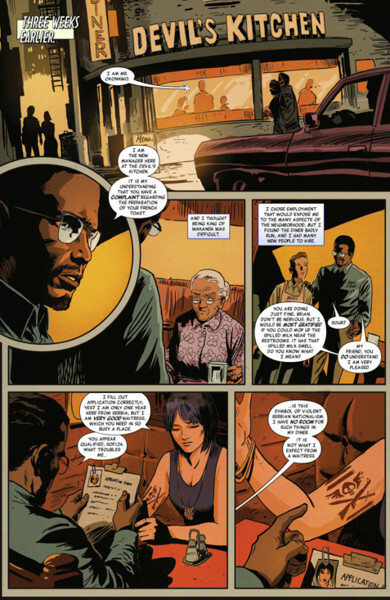 NOTE: SPOILERS AHEAD IF YOU HAVEN'T READ THE ENDING OF SHADOWLAND AND DAREDEVIL #512. Kuljit Mithra: When Marvel teased that Black Panther was taking over for Daredevil, and even taking over his numbering... it won't come as a shock that it really didn't go over too well with many DD fans who visit my site. You probably had no control over what Marvel wanted to do with this BP series, but how does it feel as a writer to hear that people might not give it a chance? David Liss: There are always going to be people who are disappointed when there is a shake-up with a title. I consider that par for the course. On the one hand, it makes perfect sense because Daredevil has a loyal following -- I am a fan myself -- and many people won't want to see him gone from his own title. On the other hand, these kinds of changes are what keep the Marvel universe dynamic. They are also a great opportunity for readers to discover new characters who they may not have cared about before. Loyalty is a big part of the comics experience, but so is flexibility. I tend to believe that, as comics fans, we don't really love specific characters, but rather we love great stories about those characters. Over the years, I've read plenty of bad stories about characters I love and plenty of great stories about characters I didn't think I cared about -- until I read the story that made me care. Our goal here is to convince people that they will love seeing Black Panther in Hell's Kitchen. The only way we can do that is by telling the best stories we can. Mithra: Was this always supposed to be starting with "issue #513", or had it been pitched as a series on its own? How did you get involved? Liss: The decision to keep the Daredevil numbering happened way above my pay grade. I became involved when the editor, Bill Rosemann asked me to put together a pitch for T'Challa taking over for Matt Murdock. At this point, Bill wasn't sure if this was going to be a new title or not, but I am personally very happy with the decision they've made. Mithra: So given the task of pitching for "T'Challa taking over for Matt Murdock"... what was your angle on this idea that Rosemann liked? What excites you most about the story? Liss: They came to me with much of the broader story mechanics already in place -- T'Challa coming to NYC, taking over for Matt Murdock, etc. I saw my big challenge as selling it to the readers -- having it make sense that T'Challa would do this, and then putting him in a situation in which he could be tested. I established a new secret identity, a set of supporting characters, and a new villain for him to face. I don't want to go into details, since I'm trying to keep things spoiler-free, but my pitch was an outline for the events of the first six issues. 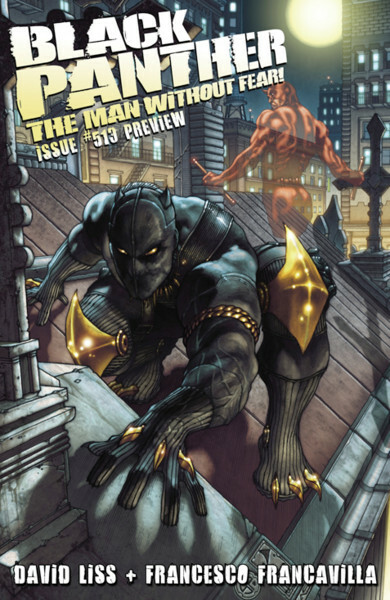 What really hooked me on writing this was the sense that it was sort of an origins story -- since T'Challa is starting over in a new place with a new power set. I also loved the idea of telling a gritty, noir, emotionally complex, morally ambiguous story. Those were the kinds of stories that hooked me on Daredevil to begin with. I think the best comics, like the best stories in general, are ones in which the outcome is uncertain and there are real consequnces for the characters, and that's the kind of story we're going for. Mithra: In Matt Murdock, we have a character now who has left his city to go find some kind of purpose, much like how T'Challa (I gather from previews) is finding himself in Hell's Kitchen. Are you finding the characters have some similarities as you've been writing? I haven't really followed BP much, so my knowledge of what he's been through is somewhat limited. Liss: Matt Murdock and T'Challa are both honorable men who will risk anything to do what is right. They are also both proud and headstrong, and they are both trying to make sense of their lives -- recently turned upside down. So, yes. I see many similarities. On the other hand, T'Challa comes with a very specific history and disposition, and his own unique set of challenges, so this is in no way Daredevil in a different costume. This is Black Panther: The Man Without Fear. It says so right on the cover. Mithra: Obviously you are going to explore what T'Challa has left behind to come to Hell's Kitchen... but in a brief nutshell, why has he chosen NYC? Had he already made his decision before hearing about Matt Murdock? Is it because of their past friendship? 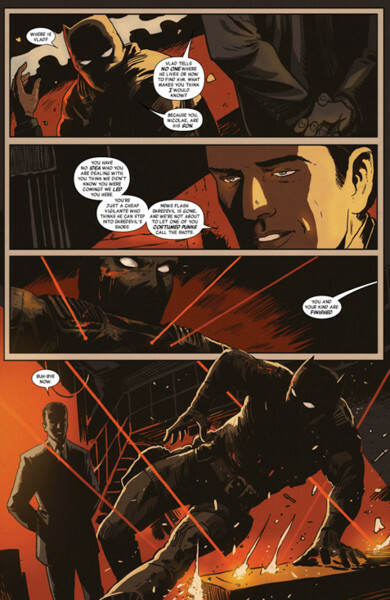 Liss: Matt Murdock asks T'Challa to step in for him. He needs someone he can trust to watch over Hell's Kitchen while he's gone. After undergoing some pretty grueling physical and emotional trials during DoomWar, and then abdicating the throne, T'Challa is looking to figure out who he is now that he is no longer Black Panther and now that he no longer has the powers of the Panther god or the Wakandan state. So he was in the right (emotional) place at the right time, the perfect guy for Matt Murdock to tap. Mithra: I can't forget to mention Francesco Francavilla's artwork. Marvel has really been pushing the preview and the "New Man Without Fear" teasers. How has it been to work with him? From following both of you online, I can see you are both enjoying the work you are doing. Is it a closer collaboration than say you just writing a script and never being in contact with him? Liss: Francesco and I have not met in person, yet, but we frequently exchange emails and Tweets, sometimes on Black Panther topics, sometimes just casually. There is just a ton of love out there for his work, and rightly so, so I'm thrilled to have him on this book. He raises the profile in a way that I, as a relative newcomer to the medium, do not. As far as collaboration goes, he generally does not weigh in on the stories before the drawing stage. Once I hand ove the script, I fully expect him to tweak visuals to suit his style and his sense of how the story should be told. That's part of the collaborative nature of comics, after all. I am in no way a control freak, and I try to script visuals that advance the story, but I also like to leave a lot of room for the artist to be able to put his creative stamp on the project -- not just the visuals, but narrative flow as well. 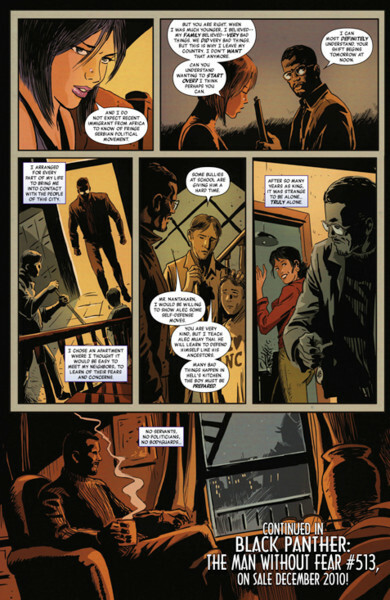 how did you write the script, in terms of panels and descriptions, since Francavilla certainly used an unorthodox layout? Liss: The first few pages of a new project are always very important. There's a ton of backstory to account for, but you don't want to bog the reader down with a whole lot of explication. I figured the way to go would be to show the new T'Challa in action, displaying both his strengths and his new vulnerabilities. One of the great things about comics is that you can lay out narrative or character or mood while also advancing action, and the two can work together perfectly, and I knew I wanted to go that way. The captions help set the mood, but we bring the reader right into the heart of the story. As for the layout, that's all Francesco, who has a great sense of how to add character to a page with creative panel placements. Mithra: From the previews, you've introduced a new threat to Hell's Kitchen. I don't want to go into too many spoilers, but what can you reveal about it? Liss: It's a new threat, though not a new kind of threat -- a crime lord named Vlad the Impaler is trying to take advantage of the current power vacuum and take over Hell's Kitchen. 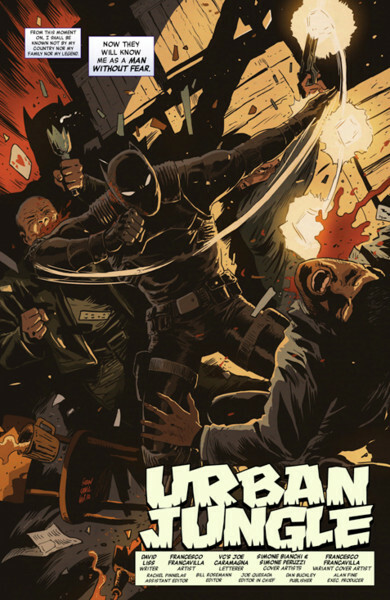 A lot of street crime is going down, gang tensions escalating, and inexplicable murders of seemingly ordinary citizens. The important thing for me was to create a character who would be a genuine threat to T'Challa, offer some real challenges, and also be an interesting personality unto himself. Mithra: Will any of the DD supporting cast make appearances in your book, or are you going to concentrate more on new characters? Liss: The first arc will concentrate on mostly new characters, but the reader can expect to see a few familiar faces in minor roles. Mithra: You've mentioned you are a Daredevil fan... in the preview I see "Devil's Kitchen" and now seeing Matt has left NYC... it reminds me of Ann Nocenti's run on Daredevil where she had Matt working at a diner and then leaving NYC as well. Were you a fan of her run on Daredevil? Liss: I hadn't thought of that. I was absolutely reading Daredevil during Nocenti's run, but her socially-conscious take on the title hadn't been consciously on my mind. Who can say what is rattling around the unconscious? Mithra: Any particular favourite creators or arcs on DD? Liss: I grew up reading Miller's Daredevil -- that's when I came to love the book and the character -- and having recently reread his run on the title, I can tell you they really do hold up. When you read the first trade paperback collection of Miller's Daredevil, you can actually watch the genre change and evolve from issue to issue. 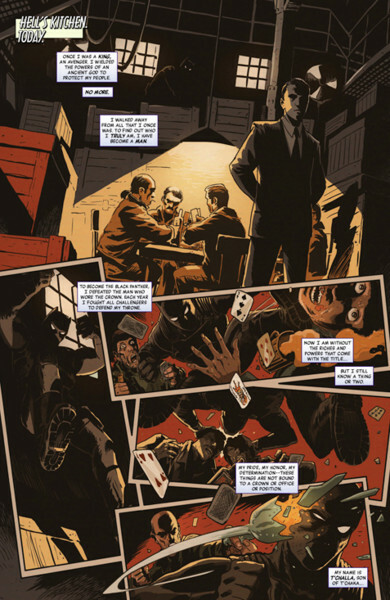 I loved Brubaker's recent run with the title, and, before that, I though Bendis's run was fantastic. In particular, I loved the Out arc. The single best cliffhanger ending of a comic I've ever read is when Bendis has Matt Murdock standing in front of a group of reporters, poised to either confirm or deny that he is Daredevil. Unlike most cliffhanger endings, in which a character is in jeopardy, and the reader pretty much knows things are going to turn out okay, this was one that could have gone either way and made sense. Everything was on the line for the character, and all the reader could do was guess. Brilliant stuff. Mithra: Thank you for doing the interview. There are certainly a lot of changes ahead for DD and Black Panther. You mentioned you planned at least for a 6 issue arc... is this an open ended series? Any last comments you'd like to make to anyone who is still on the fence about sticking around with Black Panther, while DD is away? Liss: The truth is, I don't have any inside information on how long Black Panther will be in Hell's Kitchen. My editor and I have discussed issues and plot lines well into next year, and no one has said anything to me about wrapping things up or writing toward any kind of conclusion. Like many readers, I'm also curious to know what will happen to Matt Murdock, and while it may not be the best thing for me personally, I do want to see him return to his old neighborhood as Daredevil. I'm selfish enough that I don't want him to return too soon, and if we do our job right, even resistant readers may feel the same way.